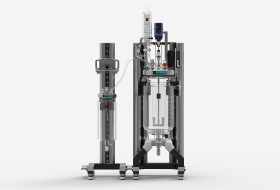 The Orb Pilot is a user-friendly, floor standing scale-up jacketed reactor providing an exceptional combination of performance, versatility and value for money. It offers a choice of vessel sizes from 10 to 50 liters on a single system, and is precision engineered to withstand temperatures from -40 to +235 °C. For more information, visit http://syrris.com/batch-products/orb-pilot or contact us.